"Remember the days of old, consider the years of many generations..."
Serving the Downriver communities for well over a century, St. Paul United Church of Christ is one of the oldest and more historic churches in Taylor, as well as the Downriver communities. Founded by German farmers, the congregation, gathered for over a century on the same site, has evolved and grown with the local area. Today, it continues to offer an active and vital ministry in the name of Jesus Christ. Although our congregation looks with anticipation towards the future, it does so with a keen appreciation for its own rich journey of faith, which has been truly blessed. St. Paul United Church of Christ had humble beginnings. It started when a group of local residents asked Rev. C. Fitzer, pastor of St. John's Evangelical Lutheran Church in Wyandotte, to conduct worship services for them at the Sand Hill School, a one room schoolhouse at the corner of Pennsylvania and Telegraph Roads. Within a short time, however, a decision was made to formally organize a church. Accordingly, a meeting was called for March 26, 1883. Twenty five families signed a charter on that occasion, establishing "St. Paul Evangelical Lutheran Church." At another meeting on April 18, 1883, a decision was made to construct a church building on ground donated by Mr. Joseph Miller on Goddard Road near Telegraph in an area then known as "Taylor Centre." A frame building was erected and dedicated to the service of God on May 4, 1884. The first parsonage was built in Fall 1885. During this same period, another group of German farmers, some of whom had attended worship at the Sand Hill School, resolved to found a second church in the area. This "sister" church, which came to be known as St. John's Lutheran Church, was constructed at the southeast comer of Telegraph and Northline Roads. It later became affiliated with the Lutheran Missouri Synod. Then and later, many St. Paul United Church families had relatives who attended at St. John's Lutheran Church and vice versa. Over the years under the leadership of pastors and associate pastors, the St. Paul congregation has undergone many changes. Changes in name, the language of worship and building facilities. Those who founded St. Paul United Church did so under auspices of the German Evangelical Synod of North America, a denomination which, originating in German Prussia, combined the Lutheran and Reformed Church traditions. Since it was chartered, however, St. Paul United Church has always been more Reformed than Lutheran in its theological orientation and worship practice. Communion, for instance, was administered on a periodic basis, five to six times per year, rather than monthly or weekly as is more common in a strictly Lutheran tradition. In 1932 when the Evangelical Synod merged with the Reformed Church (German) to create the Evangelical and Reformed Church of America, St. Paul Church changed its name too. The congregation thereafter became "St. Paul Evangelical and Reformed Church," the name that appears on the cornerstone of our present sanctuary. Finally, in 1957 the Evangelical and Reformed Church nationally merged with the Congregational Christian Churches, which trace their heritage back to the Pilgrims and Puritans of seventeenth century New England. The new merged only a monthly German-language service was offered. Ultimately, this accommodation to our German heritage ended in the late 1930's, just as the United States was about to be engulfed in another world war. The Reverend Stanley Hartmann, who arrived at St. Paul United Church in 1965, was the last German-speaking pastor. Of course, along with changes in name and language, St. Paul United Church of Christ has undergone significant alterations in its building and facilities. The original frame building was struck by lightning and destroyed by fire on May 31, 1911. Undeterred by this calamity, the congregation gathered for a special meeting on June 18, 1911 and voted to rebuild. The cornerstone for the new church, engraved with the words, "Erbaut im Fahre des herrn 1911", was laid on August 20, 1911. The new church, a red brick structure, was dedicated on May 12, 1912. A single church bell to summon church members to worship and to toll the passing of loved ones was installed in the brick steeple above the entrance door. 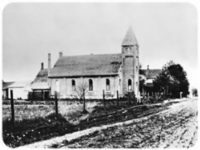 Further change for St. Paul Church came in 1946 when Wayne County decided to widen Goddard Road, which in previous years had been nothing more than a two lane dirt road. For purposes of the expansion the County acquired street frontage from the congregation running twenty-seven feet deep. Rather than move the existing church building further back from the road, the congregation voted to raze it, as well as the adjoining parish hall, in favor of a brand new, enlarged facility that could accommodate the growth of the congregation due to the suburban development of Taylor Township and the neighboring area. The parish hall was the first to go. It was demolished on April 14, 1947, creating space for the foundations of a larger, unified building. The construction went smoothly. Within six months the brick exterior was near completion. That fall, on October 5, 1947, as progress on the new building continued, the congregation gathered for its last worship service in the old church with the Reverend William J. Kuhlman presiding. After some of the sanctuary fixtures were removed and preserved for the new church building, the old structure was knocked down. "Home movies" taken by members and preserved as part of St. Paul archives, recorded the dramatic scene for posterity. As the new sanctuary was being finished, the pews from the demolished building were installed in the new Fellowship Hall, which served as the congregation's worship space for a number of months. Completed in a red brick Colonial Revival architectural style, the new church building, the third for the St. Paul congregation, was formally dedicated on May 23, 1948 to the glory of God. Incorporated in the new structure from the old were two church bells; two different sets of pews from before and after the 1929 renovation; eleven memorial stained glass windows, possibly designed by the Detroit Stained Glass Company; numerous lighting fixtures; and the 1911 cornerstone, which was placed at the foot of the balcony stairs. Less than a decade later, during the tenure of the Reverend Leonard Weigel, the new building was enhanced by the addition of a substantial Christian education wing on the west side of the church. Plans for the addition were approved by the congregation on April 24, 1955 and ground was broken on June 26, 1955. The cornerstone for the new wing was laid on August 7, 1955 and the actual dedication followed on February 12, 1957. A further addition was made to the Church in 1971 with the construction of a large kitchen suitable for preparing the roast beef and Lenten fish suppers for which the congregation is well-known. The old kitchen was converted into conference space and a gathering area for use by the choir on Sunday mornings. At the same time, an enclosed and finished breezeway, plus a two car garage, was added to the parsonage next door. In June 2016 the congregation finished and dedicated a “A Room with a View” addition at the east side of the church narthex that includes an attractive Family Room serving all ages, a lavatory, and a new convenient ramped entrance with curbside access. St. Paul United Church celebrated its centennial in 1983 with the Reverend Alvin Kauffman presiding. In September 1988, the congregation welcomed Dr. Geoffrey G. Drutchas as senior pastor. Since the early 1990's the congregation has honored its history and heritage with a permanent historical display has also been installed in the church's west lobby featuring archival photographs and memorabilia. Already well launched into its second century, St. Paul United Church of Christ continues to make history as a prominent congregation, active in Christian ministry in the local area. You are invited to help shape this history by your own participation in life of St. Paul United Church. Our future in faith begins today. St. Paul United Church of Christ is one of the oldest churches in Taylor and the Downriver area. Officially chartered in 1883 by twenty-five local farming families, it combines a Reformed and Lutheran heritage. Today, St. Paul Church is part of a family of congregations called the United Church of Christ with over a million members across the United States which emphasizes unity in Christ and faith lived out in everyday life. You are invited to join our church's journey as it builds on the past and looks with faith to the future.